So I happened to see a notice on 'the Jolly Jabber' (Fat Quarter Shop's blog) that SewCalGal is hosting a Pet's on Quilt Show. I decided I had to enter the quilt I made last year named "Deconstructed". I made this quilt as part of the Scraps to Treasures challenge on the HGTV Quilting Forum. Everyone who participated chose 2 different fabrics (light and dark) and sent in 6" squares of them for each person. The challenge was to use at least a 2" square of every fabric in your quilt. And this was what I came up with. I found a picture of a dog chewing up a roll of toilet paper and used it as a model for the dog here. I used raw edge applique and thread painting to create him. I wrote more about it all here. This quilt now hangs in my hallway where I can see it everyday and smile. 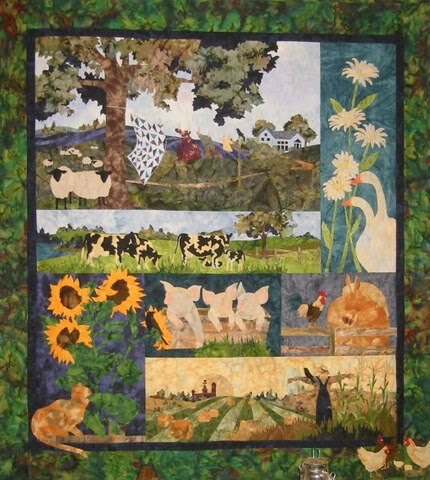 Although 'Deconstructed' was the first quilt that came to mind when I thought of the contest theme, I've made others- including this McKenna Ryan pattern, 'Storybook Farm. I made it for my mother's birthday a couple of years ago. It has a cat, horses, pigs, cows, sheep, geese and chickens on it. Be sure to check out all the other entries and don't forget to vote for your favorite starting August 14th! I love this quilt! It makes me smile every time I see it. off to vote ........for you of course. I love your quilt, it makes me laugh. Glad you used your imagination and not reality. Thanks for the smiles. Oh I have a dog and quilt just like that! (I mean a real dog and a real quilt with a couple bites out of it.) LOL!! Oh that quilt is so funny. Your dog is so good - love the quilting on it. Great job!! what a wonderful idea, I just love your quilt. How in the world did you ever think of it. Oh my goodness, to tear up the quilt. You are brave but the total quilt is just fabulous. So is the other one. And look at all your pets. They are sweet. I am sorry about Michael. thanks for leaving such a sweet comment on my blog about my dog Cindi. Beautiful quilt such a sweet litte 'bad' dog. Thanks for showing your kitties too. wOw!! Deconstructed is an AMAZING quilt! I love everything about it.... you did an unbelievable job on it. Thank you so much for sharing it. I love 'Deconstructed'! Fantastic idea. I love everything about that quilt! Also love your cats. How does that little black one (is that David?) squeeze himself under your machine like that? You must be a very gentle and careful sewer! Fantastic! Love your quilt and fur babies. "Deconstructed" is just amazing -- you're pretty brave to cut up a beautiful quilt -- but it works so well. Brilliant! Deconstructed is an amazing quilt. Love it. Also enjoyed all your other quilts and four legged children. Absolutely beautiful. Thank you so very much for sharing in the Pets on Quilts Show. What a wonderful quilt. Thanks for showing it. Deconstructed is my favorite quilt in the show - I LOVE IT!! (and I'm not a dog person) LOVELY! Fabulous quilt!!! How creative. Thanks for sharing! I'm a dog person so I love your quilt!!!! What a lovely quilt, the applique is so realistic! Well done! 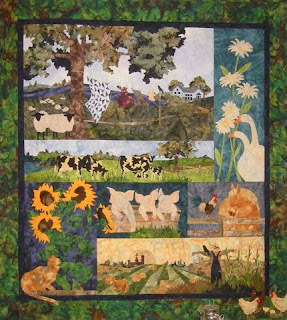 Your quilts and pets are beautiful. I love the Deconstructed one the best. It's so cute. Your kitties and poochy is too sweet! The deconstruction quilt is great! Thank you also for adding scripture to your blog. I need to remember your 1 peter3:8 verse when I start to get rushed when I'm late for something/someone!Thanks for the reminder! I love it. The Deconstructed quilt is beautiful, the face of the puppy is so cute.